the original box package without two siccisors, please contact us via 570550382@qq.com and we will give you full refund or partial refund of two scissors. One of distinctive feature of this dog grooming clippers is its 5-Speed Change. There are five level speed-5000/5500/6000/6500/7000 rotation per minute. Different speed feature is designed to cut hair of different parts. You cannot buy a turbo function clipper from other seller with such price. Moreover, the maximum speed is 7000 rotation per minute. Such powerful motor is unparalleled at this price. Other versatile speed pet clippers are all at price above $100. This professional dog clipper can automatic stop running if the blade is overused. When the blade is used for a long time or there is a lot of hair in the blade, the clipper will produce a "buzz" sound and switch off itself to remind you that it's time to add oil to the blade and clean the hair in the blade. The clipper will stop working itself to protect the blade and clipper to ensure its long lifespan. You cannot find this intelligent function on other pet clipper. The rechargeable 2000mA Li-ion Battery inside the clipper can supply the power 4 hours without interruption. The cordless plus the super long power supply feature is perfect for long hour clipping. If you are not satisfied with our product, we will offer you full refund or new replacement. You do not take any risk to purchase here. This professional pet clipper is very high quality, welcome to try this product and you will not regret your choice here. [②Versatile 5 Speed Professional Pet Clipper, Best Price Heavy Duty Clipper for Thick Coat Dog on Amazon] PRO dog clipper with 5 speed setting-5000/5500/6000/6500/7000 rotation per minute. Different speed level offers users more choice. The maximum speed is 7000 RMP. Such powerful motor is rarely seen on Amazon. You also can not find versatile 5 speed pet grooming clippers at this price. [③Continuous 4 hours cordless power supply] This professional dog clippers can be used with cord or cordless. The built in 2200mA Li-ion battery inside can supply the power without interruption for 4 hours with just 3 hours charging. You can also use it with cord for extremely long time clipping if you are a professional groomer. The big capacity battery plus the cordless feature are perfect for professionals. 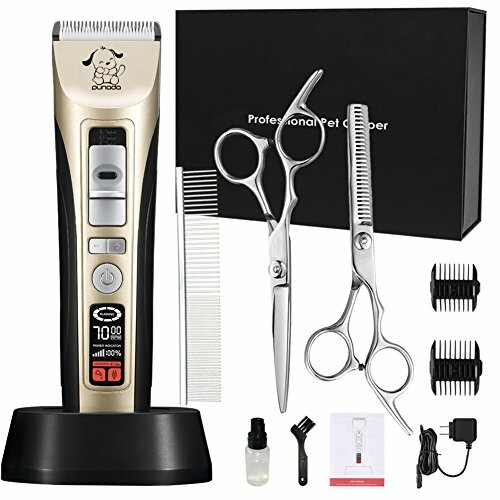 [④User-friendly Design, LED Screen Smart Indication] This pro pet clipper is designed with Led screen to remind the power use, the speed it is running, the time to add oil and clean the blade. This function can help users to better control hair clipping process. Moreover, users can know better about the blade use condition and maintain it for a long term use. [⑤Powerful Motor for Thick Coat Dog, Cat and other livestocks] The motor is extremely powerful with maximum 7000 rotation per minute. The speed is quite suitable for thick hair animal. Also you cannot find such powerful motor clipper at this price on Amazon. Compare our speed with the brand one, such as Oster, Andis, you will have a better idea of how powerful our clipper is.